"This is a very easy salad to make and you can add almost anything to it. We like adding shrimp but you could use tuna or crab." Break pasta in half and cook in a pot of boiling salted water until al-dente. Drain and cool under cold water. 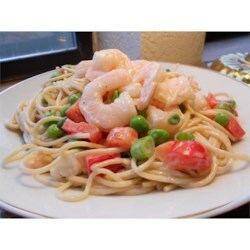 In a large bowl, combine the pasta, celery, seafood, onion and peas. Toss with enough dressing to coat. Refrigerate until chilled and serve. I'm sorry. Just tasted like ranch dressing and spaghetti. Did not like. This was really good. I used whole wheat spaghetti, red bell pepper, frozen cooked shrimp, green onion, and light ranch.